Today i want to give you a visual on what 25g protein looks like in the real life. 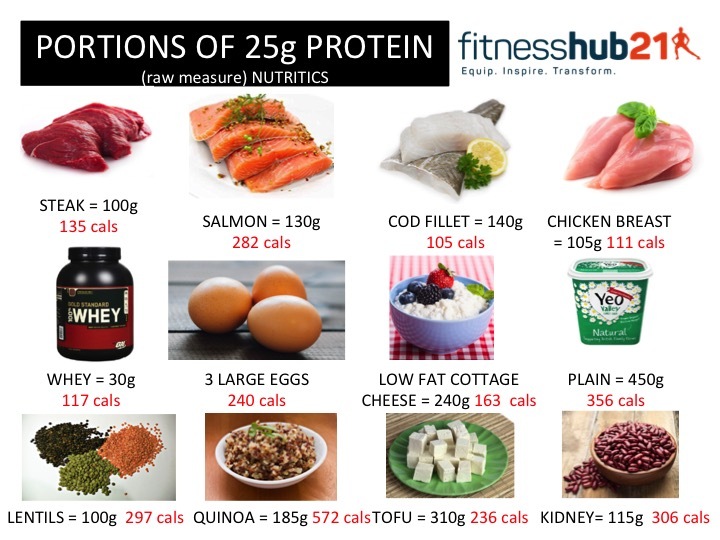 Below is a slide of what 25g protein looks like. If you were aiming for 100g protein a day then this would represent 1/4 of your intake each day. If you base your protein intake on 1.2-2.2g/kg body weight you can work out how much you need each day. Last week we went through the benefits of protein, this week it’s what does a meal with 25g protein look like. In your day you may have salmon and eggs at breakfast, chicken salad with feta at lunch and then red meat with rice and vegetables for dinner. If you are vegan or vegetarian adding a rice or pea protein powder to your day can help increase your protein intake overall. You can also eat quinoa, soy, seeds, nuts and legumes to help boost your protein intake. If you need help with finding ways to increase your protein, book in for a chat and we can work it out. This is just a small list of foods containing protein – there are many other foods you can choose from in order to meet your daily requirements. After adequate calorie intake our protein intake is next in line in importance to fat loss and body composition. Don’t just increase protein without making other dietary changes, especially if you want to lose weight. A great place to start is to increase your protein but decrease the starchy carbs (rice, bread, pasta etc) you eat and replace them with more vegetables as these are lower in calories, you can also decrease the amount of processed foods you eat and the frequency of very high fat and high sugar foods which constantly tip you over the edge in terms of calories.